This Light Award is sponsored by Thea Westra of Forward Steps and processed through Kiva.org. 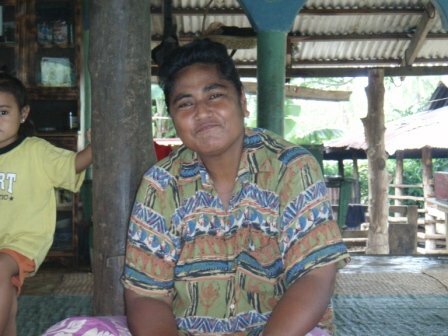 Karoline is our November 2007 Light Fund Winner from Samoa. Her husband is a security officer earning 100 Tala (USD $40) per week. Karoline was born in the village and has always been a village lady. Her husband has a heart problem and he’s not a strong man, which means he misses going to work most of the time. This is the reason why Karoline joined the program, so that she can have financial support to start up her business, help out her husband in supporting her family, and be able to earn profit. Karoline’s four children are all attending village school, and she’s aiming to save up so that she can send them to better schools and also provide them with their school needs. With her requested loan, she aims to improve her business and save money for their children’s future.